Schindler, a leading provider of elevators and moving walks, announced two groundbreaking mobility solutions: Schindler Ahead and myPORT at CTBUH (Council on Tall Buildings and Urban Habitat) Middle East Conference 2018 being held in Dubai and Abu Dhabi. Held under the theme of “Enabling Smart Buildings for the Future”, the five-day global conference (October 20 to 25) has attracted local and international key stakeholders and decision makers in the industry. “The Mena region is one of the key markets to the group, and therefore, we aim to be the best service provider in the industry for customers by continuing to develop highly innovative and user-friendly mobility solutions specifically tailored to the market”, he added. Schindler Ahead offers an innovative digital solution for elevators and escalators, enabling a complete range of new digital products and services. The human-centric platform uses the Internet of Things (IoT) to bring ease in the daily maintenance of units by using insights captured from real-time data. Schindler Ahead will enhance equipment reliability and uptime, while significantly improving safety and offering a superior passenger experience. 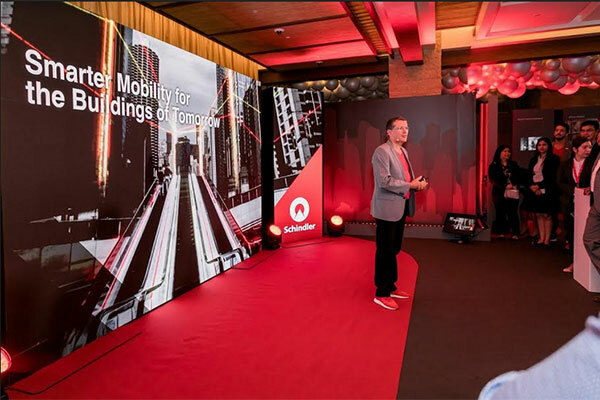 Schindler has also developed a unique application known as myPORT, which is a smartphone-based service for personal mobility that offers a seamless four-step identity verification on entry, and user-friendly “e-banking level” security. Once inside the building, myPORT allows users to move throughout the building just by a click on their smartphones. As a result, occupants will have more freedom and convenience, and building owners will get greater access control.